I’m elbow-deep in bubbles on a campsite in the Ogwen Valley, filling the washing up shed with the gorgeous scent of citrus orange. When I’ve finished here I’m going to pop over to the shower block and wash myself and my hair with… yep, more citrus orange! 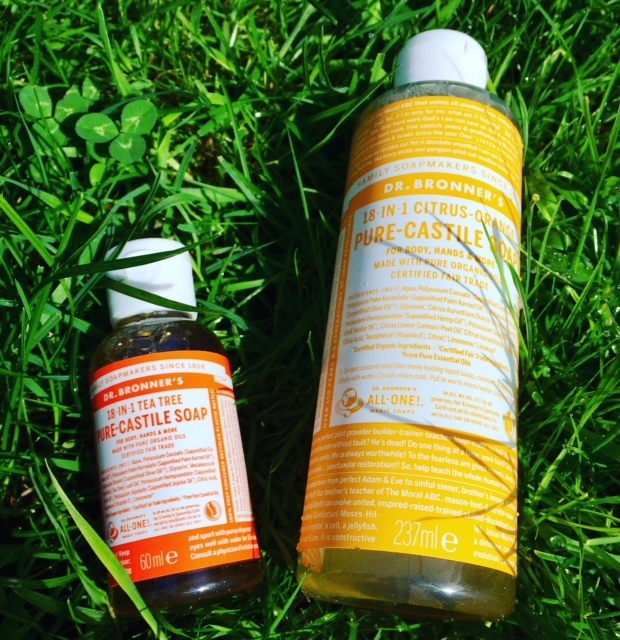 I’m trialling Dr Bronner’s 18-in-1 Pure-Castile liquid soap, and where better than a windswept field at the foot of one of Wales’ hardiest mountains? A gale is determinedly rattling the wooden door but, in here, it’s like beginning to smell a lot like Christmas. I think I might just start mopping the floor next. The ‘18 uses’ is no faint claim; this magic soap can be applied to washing your face, body, hands and hair, used as bubble bath, for shaving, laundry and rinsing fruit and even for aromatherapy. I might draw a line at cleaning my teeth with it (people do!) but I will definitely wash the dog, in the hope he will look slightly more impressed afterwards than when he comes out of the groomer’s with a sky-blue neckerchief knotted prettily around his great big ears. In fact, Dr Bronner’s claim should be ‘18 plus uses’, with customers regularly telling the brand about their own inventive ways to use the soap (sounds like a challenge right there, to me!). But what I love is the socially and environmentally responsible bit. Dr Bronner’s is not tested on animals, is certified for vegans, carries the socially responsible Fair For Life standard and is a non-GMO product. Oh, and did I mention it smells delicious? It’s available in a emporium of scents; as well as the orange (my favourite), I also love the tea tree and have still to work my way through lavender, eucalyptus, almond, green tea, peppermint, rose… there’s even an unscented version for babies! I head over, in pitch blackness, to the shower block, where my heart sinks to discover I need tokens, not 20ps, to access hot water. I’m about to trudge over to the farmhouse in search of a token-selling farmer, when a freshly-laundered man (yep, it’s a unisex shower block – thankfully, he’s clothed) kindly offers me the last of his tokens. Then I discover I have just five minutes before the hot water runs out; as the meter is OUTSIDE the shower cubicle in the UNISEX changing room, valuable seconds of steamingly hot water are going to be wasted while I dive into the cubicle and undress against the clock. I think of that old advert; you know, the one where someone takes TWO bottles into the shower? 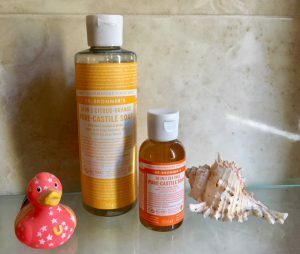 Not me, I just slather myself from top to toe in citrus orange, only regretting wasting time earlier by not bringing my camping crockery in here too. Dr Bronner’s comes in a range of sizes, from an enormous 3.8 litre refill bottle down to a handy-around-the-house 237ml and a rucksack-ready 60ml for hiking and camping adventures. For more details and the full range of fabulous flavours, visit www.drbronner.co.uk. This is a sponsored post. All reviews are my honest opinion and I work only with brands I believe in and have personally tested.